UPPER EAST SIDE, NYC — I started food blogging 10 years ago. At that time, there was a relatively scant amount of us, lone individuals, fewer among us with a camera, and lesser still those of us who knew how to use them. We were food lovers — not "foodies" — who appreciated the efforts, talent, and skill of the people who painstakingly strived to put good food out to a grateful public, as well as admired the characters, personalities, and histories of those people. Flash forward about 7 or 8 years, and and this city's storied food culture has been subsumed by a generation of folks who only appreciation of food is how well they can run an Instagram filter through a picture of a food or dish to share with countless others who have done the exact same thing with the exact same food in the same day alone. I briefly lost my interest in food-blogging, especially once there were myriad food blog companies and businesses that had teams of people to do the same work as I had been doing but at a far more prolific clip. I acquiesced with an "Oh, let the hacks have at it!" But as I continued eating my way through this city, I became more despondent as I watched my social media feeds blow up with pictures of cronuts (still?! ), rainbow bagels, and cotton candy milkshakes. And even away from the internet and in the "real" world, I watched businesses suffer gravely from Yelpers who gave poor ratings just because they weren't treated like royalty during their visit to a restaurant. And even being in the industry, I noticed a marked increase in, again, younger folks entering into the food service industry with little experience and no vocational pedigree, who expect to be made an executive chef within 6 months of employ, but not before they request some time off so they can audition for a Food Network television show. So I returned to my blog, changing the name from PHUDE NYC (that iteration no longer a novelty as being food pic-focused) to KAC Food, promising myself to concentrate more of the people who are responsible — through hours, days, years, lifetimes, and generations — responsible for creating such foods that anyone only regards as photogenic. And in this current iteration I have enjoyed the unplanned attention of other folks whose interest in food is as deep and as wide as mine, being invited to culinary events to expressly cover the people who work very hard to bring food and community together. A recent invitation especially piqued my interest, as it wasn't from or for a chef or restaurant, but was instead for a book — a book solely about the vast variety and histories of the people who make New York City still the food capital of the world. The book is called FOOD AND THE CITY: NEW YORK'S PROFESSIONAL CHEFS, RESTAURATEURS, LINE COOKS, STREET COOKS, STREET VENDORS, AND PURVEYORS TALK ABOUT WHAT THEY DO AND WHY THEY DO IT, and is written by INA YALOF, a writer, author, and journalist who has written for numerous publications, including GQ, Harper's Bazaar, and New Yorkmagazine, among others. 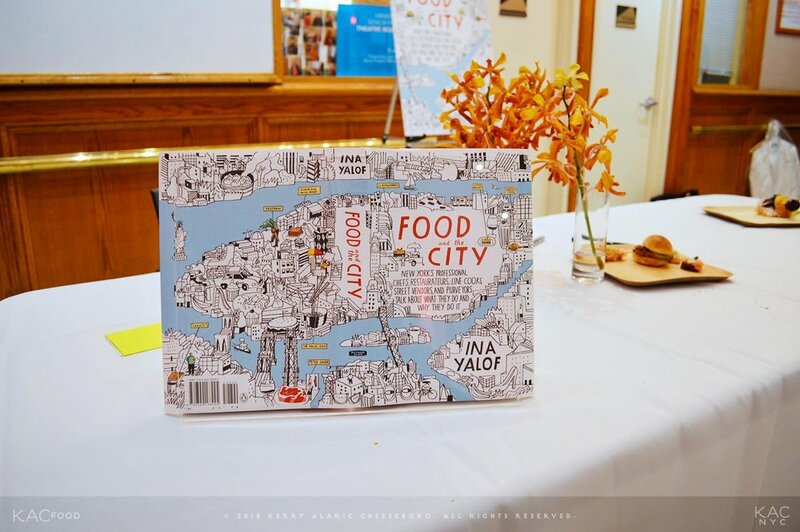 The event featured Ina speaking at the 92nd Street Y for their Kitchen Arts & Letters series. Ina traveled through the five boroughs to give her readers a behind-the-scenes look at manner of food (and beverage) service, interviewing workers from casual dining spots and street carts to five-star establishments, from immigrants who are enjoying recent popularity (JELENA PASIC of highly successful HARLEM SHAKE, MOHAMMED ABOUELENEIN of the locally revered HALAL GUYS food cart) to families who have maintained near landmark consideration for generations (Fox's U-bet syrups, Crescent Duck Farms in Long Island). The book itself is an excellent, comforting, enlightening, and friendly read; Ina is skilled at letting the characters of her interviewees speak for themselves, injecting her own perspective just to keep the proceedings conversational. Much like the city itself, the books subjects are convivial, entertaining, to the point, and with an "amuse bouche" (my apologies) of a story at the ready to give you a quick taste of what they're about. All the while you get what Ina's about, her writing voice the same as her speaking one: accessible, enthusiastic, informed, and refreshingly sociable. Meeting her in person for the first time at the event, her disposition and dialogue make you feel you've been friends with her for some time. You trust every word she effortlessly has you hanging on. Especially hearing her recount adoringly the story of the young Tunisian woman who — with little English and no kitchen experience — started cleaning restaurants and wound up become the executive pastry chef at Daniel, or of the Jamaican woman cranking out 47,000 meals a day for prisoners and staff alike at Rikers Island. You can't have a food-related function in New York City without offering food, so of course some of the people and food featured in the book made appearances at the reception. Being ever still the blog photographer, I missed eating some of the food (and while eventually eating the food, missed taking some pics of some of the VIPs in attendance, including BRYCE SHUMAN, executive chef of BETONY, who spoke as well with Ina during the event). But I was able to capture Jelena with ED SHOENFELD, food guru and owner of REDFARM, as well as STACY ADLER of Y-CATS CRAFT SERVICE & JAYSE CATERING. The food, from a number of vendors, was delicious; the Harlem Shake hot honey chicken sandwiches and platters from SHATZIE THE BUTCHER and NEWMAN AND LEVENTHAL CATERERS were vanquished quickly. By the time I left the only remaining edibles were the tasty, rich SYLVIA WEINSTOCK cakes from that were still being ravished by gourmands who still had reft left in their already grateful tummies. In the press release that accompanied my invitation, there is a telling quote from Ina Yalof: "What makes the great ones great ... is that when it comes to food, they know even the most minute detail can make a difference." I am grateful for Ina for highlighting the reality that, in this new pseudo-culinary era of celebrity chefdom, hashtags, Yelp reviews, and "Instafood", the true value — the true heart and purpose and gift of food — is in the details of the people who make it, live it, and love it. And even the people who write about.